This blanket is sure to keep you warm on a cool night. perfect for Bonnaroo, Lockn, , Summercamp or any fest! This high quality Mexican made festival blanket that is approximately 55" x 74". These blankets are about 10% heavier than other similar ones sold on the internet. 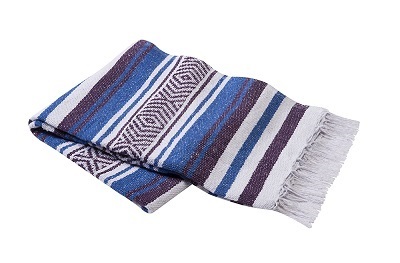 This traditional multi purpose and heavy-duty striped acrylic blend blanket is great for yoga, picnics, festivals, concerts, ball games, decoration, throw, etc. They are machine washable, and made from eco friendly recycled fibers. Get the color you want from SunshineDaydream.Biz!